A typical weather radar image, similar to one we might see on the local news. This one is of weather over and around Japan. Courtesy: The Weather Channel. Weather radar can give us advance warning of potentially dangerous weather, such as tornadoes. Courtesy: National Severe Storms Laboratory. 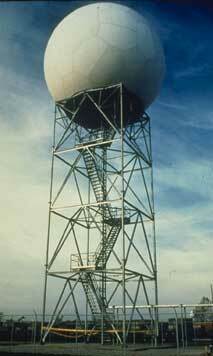 One of the radars in the NEXRAD network. 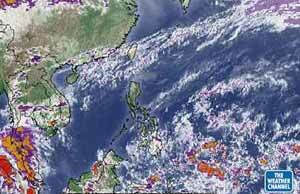 Courtesy: National Oceanic and Atmospheric Administration. The idea that radar could be used to detect precipitation (rain, snow, etc.) was first suggested in 1941. A year later, testing of early radar systems showed that rain did show up on radar screens. In fact, when the weather showed up on these early radar screens it created big problems. Engineers found that storms appeared as large areas of moving “clutter” on their screens and obscured the targets (such as ships or airplanes) that they were seeking. The military were quick to exploit the discovery that radar could be used to detect weather. The military trained dozens of meteorologists in radar technology and by 1943 surface-based and airborne weather radar observations were being established worldwide by the United States armed forces. Following World War II, governments throughout the world continued to actively support weather radar research. Radar probing of the interior of storms provided an invaluable tool for cloud physicists, meteorologists and hydrologists (scientists specializing in the study of water collecting on the ground). Initial studies focused on the development, movement, and structure of precipitation “echoes” (or reflections) and on the relationship between radar reflectivity and rainfall rate. These echoes were analyzed to further the understanding of storm physics and were used by meteorologists to enhance forecasting. Initially, the weather service in the United States, then called the Weather Bureau, used military surplus radars left over from World War II. These radar sets could detect the presence of a storm and provide information about its location, but the images of storms that appeared on the radar screen told little about the intensity of the storm. The water droplets in falling rain reflect the radar waves beamed at them. The strength or “amplitude” of the reflected radar waves is an indication of the intensity of the storm. Thunderstorms produce more intense radar signals than do light rain or snow. In 1960, research on the application of Doppler radar for probing the atmosphere began to have meteorological applications. The Doppler effect is a frequency shift caused by radar waves bouncing off a moving object. It is similar to the way a train horn changes pitch as the train passes you. In radar, this change of “pitch” in the reflected radar signals can be interpreted by circuits in the radar receiver and used to determine the speed of a storm. This is particularly important for severe storms such as tornadoes and hurricanes. By 1967 progress in this research motivated the U.S Departments of Commerce, Transportation, and Defense to sponsor the Joint Doppler Operational Program (JDOP), to develop a system to enhance the prediction of severe storms. The National Severe Storm Laboratory became the center for this research. Radar data are used by computers for generating wind, wind shear (sharp movement of air during storms), storm intensity, and hazardous weather information. The latest Doppler radar sets locate feature of tornadoes that provide meteorologists with the information needed to issue reliable hazard warnings tens of minutes before a tornado even touches the ground. In the United States, the federal government operates a network of weather radar stations called NEXRAD, which completely covers the entire country. The data generated by NEXRAD are disseminated to governmental and commercial users for use in the preparation of storm and flood forecasts and meteorological studies. Information gleaned from NEXRAD is used to create time-lapse radar displays of storms, a regular feature of TV weather reports that show weather systems in motion. Doppler radar is also used to detect the microburst, a type of wind shear occurring near the ground resulting from the outflow from a thunderstorm. 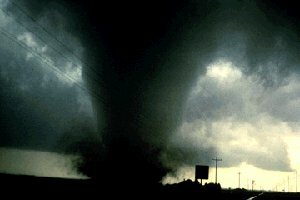 A series of microburst-induced aircraft crashes prompted the United States Federal Aviation Administration (the FAA) to develop a technology called the Terminal Doppler Weather Radar (TDWR) to detect and automatically report timely warning of the airspeed loss associated with low altitude wind shear. The system also incorporates an effective detection and prediction system that provides tens-of-minutes warning of a surface wind shift that necessitates a change of runway operation. The TDWR was the first operational weather radar to provide hazard warnings and wind shift predictions without requiring interpretation by a trained meteorologist. Weather radar has also become critical in the aviation industry. Owing to the need to provide coverage of weather over a large area, “netted” systems that combine data from several ground-based radars, and other sensors generate weather products used by both the FAA and commercial aviation traffic managers. The FAA also uses automated sensor netting systems in both the terminal (airport) area (Integrated Terminal Weather System) and the en route airspace (Center Integrated Weather System) to provide air traffic managers with graphical displays that present the current weather situation and indicate the short-term forecast of storm position. Meteorologists and engineers continue to study ways of using radar to better understand the atmosphere and to advance weather forecasting. Among the challenging meteorological topics being investigated in which radar plays a role are the initiation of convective storms, detection of surface (boundary layer) winds, improved two to six hour forecasts, identification of rain, snow, and ice within a storm. This page was last edited on 28 September 2015, at 19:01.